In the light of Benha University strategy to activate the policy of international openness and within the framework of the international cooperation project between the Faculty of Veterinary Medicine, Benha University and the Institute of Anisis, France, co-funded by the Academy of Scientific Research and Cambes France. A workshop was held at the French Institute where a brief overview of the Faculty of Veterinary Medicine and its research and laboratory capabilities was presented through a lecture by the Dean of the Faculty, Prof. Mohamed Mohamed Ghanem, in addition to another lecture delivered by the main research of the project. Which reviewed the work team and the work plan of the project and what has been achieved from the Egyptian side. Dr. Karim Boumedienne, the project's main researcher and representative of the French side, gave a lecture explaining the achievements of the project plan and the presentation of the future plan which begins with holding a workshop in October 2018 in Egypt. 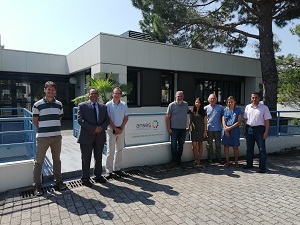 The workshop was attended by Dr. Richard Terry, Director of the Institute and Dr. Oded Rous, Director of the National Reference Laboratory for the Protection of Unconscious Species in France, and discussed the preparation of a scientific agreement for the mutual practical exchange between the two sides in the field of training and exchange of faculty members and joint scientific publishing.